The Library of Congress (LOC) is the research library that officially serves the United States Congress and is the de facto national library of the United States. It is the oldest federal cultural institution in the United States. The Library is housed in three buildings on Capitol Hill in Washington, D.C.; it also maintains the National Audio-Visual Conservation Center in Culpeper, Virginia. The Library's functions are overseen by the Librarian of Congress, and its buildings are maintained by the Architect of the Capitol. 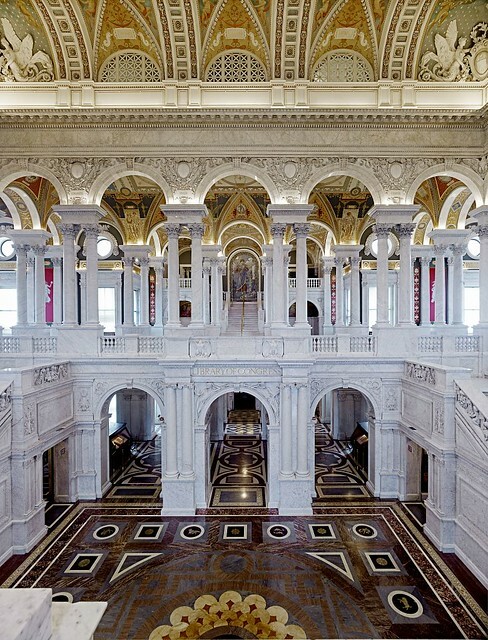 The Library of Congress has claimed to be the largest library in the world. Its "collections are universal, not limited by subject, format, or national boundary, and include research materials from all parts of the world and in more than 450 languages. "The Library of Congress moved to Washington in 1800 after sitting for 11 years in the temporary national capitals in New York City and Philadelphia. The small Congressional Library was housed in the United States Capitol for most of the 19th century until the early 1890s. Most of the original collection had been destroyed by the British in 1814 during the War of 1812, and the library sought to restore its collection in 1815. They bought Thomas Jefferson's entire personal collection of 6,487 books. After a period of slow growth, another fire struck the Library in its Capitol chambers in 1851, again destroying a large amount of the collection, including many of Jefferson's books. After the American Civil War, the Library of Congress grew rapidly in both size and importance, which sparked a campaign to purchase replacement copies for volumes that had been burned. The Library received the right of transference of all copyrighted works to deposit two copies of books, maps, illustrations, and diagrams printed in the United States. It also began to build its collections, and its development culminated between 1888 and 1894 with the construction of a separate, extensive library building across the street from the Capitol. The Library's primary mission is to research inquiries made by members of Congress, carried out through the Congressional Research Service. The Library is open to the public, although only high-ranking government officials and Library employees may check out books and materials. 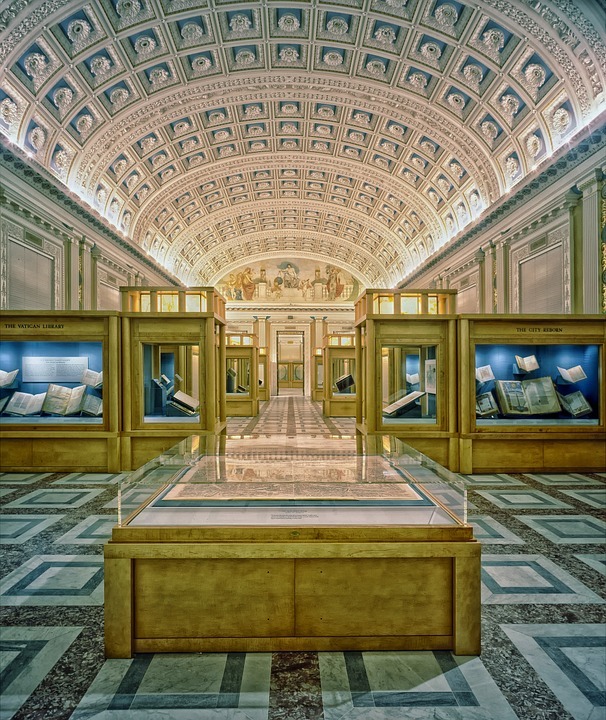 If you're going to the Capitol, don't miss the Library of Congress. The classical features of the building are even more ornate than most of the other structures in Washington, DC. The architecture alone is worth the visit. There are also special displays (there was one on graphic arts in early 2018). There's also a room that contains Thomas Jefferson's personal collection. The reading room is huge and although you can't access it, the glassed in overlook gives you a view of the space. Outside is a spectacular fountain with a sculpture of The Court of Neptune. Pros: Stunning architecture. Fascinating exhibits. Conveniently located near other attractions. Very helpful staff. Pro tip: look for the stairs to the basement and take the small tunnel to the Madison building. Take the elevator to the top floor to get to the cafeteria. Eat a nice lunch overlooking D.C., away from the tourist crowds. There is another tunnel that goes to the Capitol building, if you want to take a tour there. This was an amazing building. Easily the most ornate library I have ever visited. The reading room was one highlight. Amazing to see the room where old and one of a kind books can be read. Beautiful public areas. The amount of knowledge contained in its collection is hard to fathom. You can even get a Library of Congress library card. If you are in DC you should visit. We are looking forward to visiting again and again. This is a huge resource of mostly real information that is still in tact. Our history is important and the Library is a great place. Blessings to all Our videos & photos show the truth of our world, not the web of lies. Spend time with loved one's helping one another in kindness and peace. Working our lands, riding bicycles, etc. building memories for heaven. ps. we never die. The Library of Congress is considered as the oldest federal cultural institution in the United States. While its exterior architecture is stunning, the inside is just as grandeur and beautiful. The paintings on the ceiling are incredible and you have plenty of time to spare, read the quotes on the walls and ceilings.